I don’t see the uservars in my esxi 6.5 install. I am on the html5 management pages.? Rene – thank you for this! Is it possible to expand this to include the upssched tool as well? I would like to power off my ESXi hosts as soon as the ONBATTERY event happens vs waiting for the LOWBATTERY trigger. It seems only the upssched tool will allow me to do this by calling it in the NOTIFYCMD line in the upsmon.conf. Forgive me, I forgot to mention the ending detail, which is the requirements of adding the upssched tool – this would allow using the NOTIFYCMD line in the upsmon.conf to specify upssched to call specific actions instead of just logging the event. I understand your need Shawn but running an shutdown on ONBATT event is risky. I have many micro power cuts of less than half a second that UPS can handle with no problem at all. It would make more harm than benefit. Can you consider modifying the LOWBATT threshold (if your UPS allow it to be configured) ? Adding upssched is not really a problem. The problem is to pass upssched a configuration file. Rene – yes I had heard that concern as well. I believe upssched allows the ability to wait a time before taking action: OB Trigger -> Wait 90 seconds -> Trigger Shutdown. But I’m not extremely familiar as I just started playing with this. I am looking into the LB threshold as an option, I want to be sure its not going to shutdown the primary system connected to the UPS. Ok so I had a chance to test out changing the low battery timer – unfortunately it did as I feared and also shutdown the local machine it was attached to. I’m not sure there is a way I’ll be able to achieve my desired result without using the upssched function. Do you have the basis for the code you put together in a repo? Perhaps I can try to dig in, understand, and make some adjustments? 10% of the power is not enough to shut down the system. How can I set it up? Well this depends on your UPS. This value is stored in the UPS and, in most cases, is configurable. On your nut server, use command upsrw to get the configurable parameter list and get/set possible values. I own several UPSes, some will have a battery.charge.low parameter and others a battery.runtime.low parameter. The first is a percent of the battery charge (as yours) before sending the LOW BATT event, the second are the remaining seconds estimated by the UPS. This is out of scope of the ESXi NUT client. You need to use a full NUT server installation to configure that. J’utilise le service NUT de FreeNas pour la partie serveur et je viens de mettre en oeuvre le client 2.0.0 sur un hôte ESXi 5.5U3. Y a-t-il un moyen de tester la communication entre le client et le serveur ou l’UPS via le serveur, autre que de faire le test de défaut d’alimentation secteur? Par ailleurs, mon hôte de production est sous ESXi 6.7 U1 (avec licence essentials). avez-vous pu tester le NutClient ESXi 2.0.0 dans cet environnement? 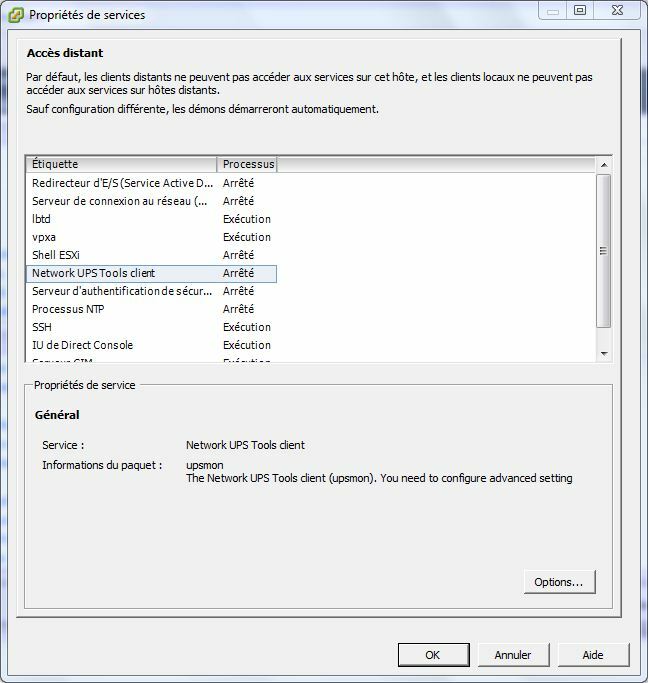 Le client fonctionne avec ESXi 6.7. 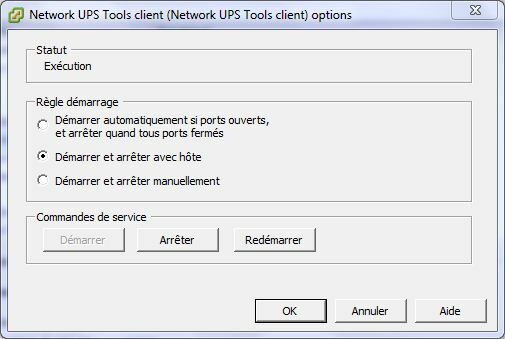 Pour tester la communication il est possible de regarder dans les logs de serveur. La connexion devrait apparaître. Sinon il y a aussi la syslog de ESXi où la connexion au serveur NUT devrait apparaître. Thanks for the tutorial. Is there any way to check if connection to NUT server is ok, or to view notify comands? I see there is NutSendMail option, but I can’t configure smtp on Esxi I think. Check server connection on NUT server log. You should see the incoming ESXi connection. The embedded mail client will use the DNS MX record to send the mail directly to destination address. It’s just a very simple smtp mail client. Thanks for the fast reply. I added -r option in notify.sh to point at my relayed mail server in the network, instead of default domain . Now it’s working perfectly. Thanks for your article, I followed it to install and configure my ESXi 6.7u1 as NUT client. Also I wanted to receive an email when communication was lost so I added script into /etc/rc.local.d/local.sh to modify upsmon.conf.template with « NOTIFYFLAG NOCOMM SYSLOG+EXEC » which works. Many thanks. I tried to install it on two different ESXi 6.7 instances, unfortunately it doesnt seem to work. I couldnt test the installation, because there’s no « upsc » binary nor « /etc/ups » folder created during installation. Thanks for sharing. I’ve installed following the guidelines and can set the 6 parameters in ESXi. Could you give me some pointers about how to troubleshoot? J’ai suivi ton tuto et il fonctionne parfaitement sur 6.7. J’ai tapé la commande et cela donne un paquet d’infos. It looks like some how I’m gretting file corruption? The checksums are both correct (identical to the post above).